Thanks to Contigo for the product samples. All thoughts are my own. Our summer vacation has taken us to the beautiful beaches of NC this summer. While we're not far from the coast (about 3.5-4 hours), getting there can certainly feel like a road trip when you have small children. 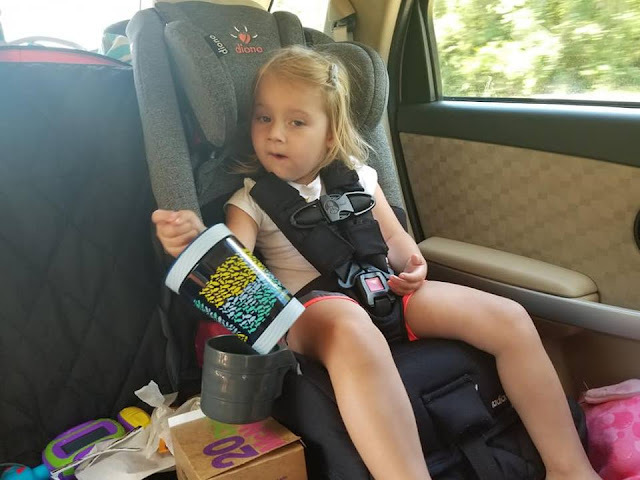 The kids always wind up hungry and thirsty, and of course, make messes in the car. For our latest trip, we tried out some new cups and water bottles that kept our drinks cool and kept messes to a minimum. You won't have to worry about spills at home or on the road with the Spill Proof Kids Tumbler by Contigo. Car trips are usually stressful for us. There's often a good deal of crying and whining, and that leaves me feeling like I want to pull my hair out. Passing drinks back to the kids in the car has been challenging in the past. Baby S loves to turn her sippy cups and water bottles upside down, just to see if she can get her drink to trickle out. She usually succeeds. 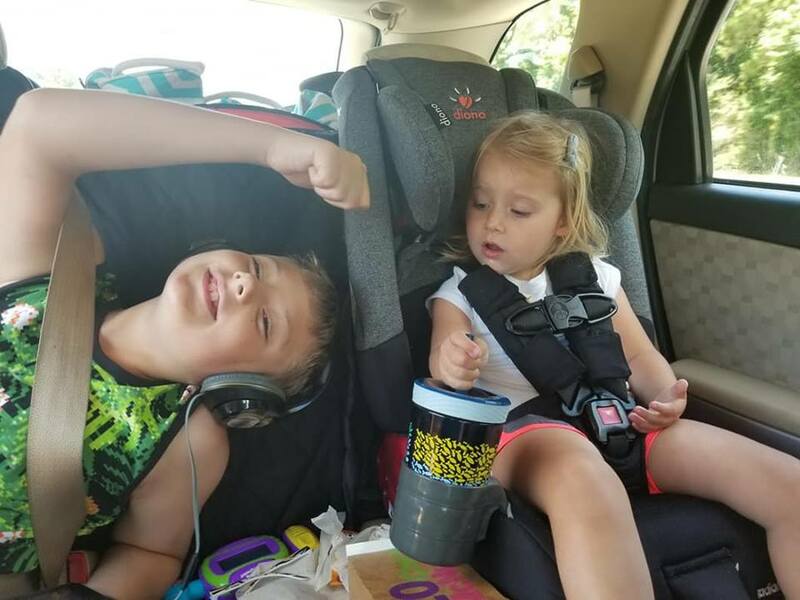 Both of the kids tried out their new Contigo Spill Proof Kids Tumblers on our way to the beach, and not a drip or drop of their drinks ever came out of the cups! 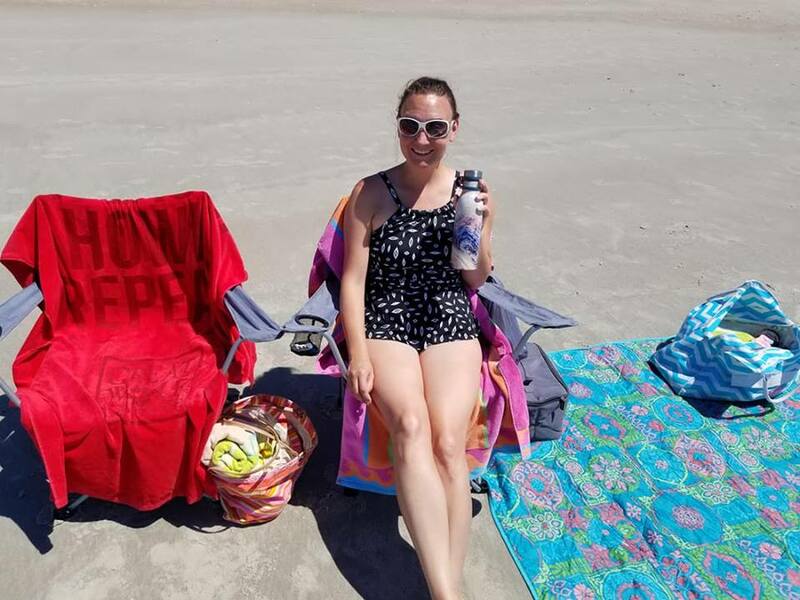 I was able to chill out the whole way to the beach without having to worry about spills in the car. These tumblers make my kiddos feel like big kids. They see their mom and dad drink from big versions of tumblers just like these. They love the design (and there are other cute designs to choose from), which featured little fishies. This was perfect to bring to the beach! Since the tumblers are spill and leak proof, I didn't have to worry about the kids spilling drinks in the beach house. The house belongs to friends of ours, and in years past, I haven't let the kids take their drinks beyond the kitchen table. This year, thanks to their Contigo kids tumblers, they've been able to have their cups in their bedrooms at night, filled with water, or take them into the living room. Baby S, about to drop her tumbler on the floor of the car. Not to worry- it's totally spill proof! The gorgeous Couture THERMALOCK Vacuum-Insulated Stainless Steel Water Bottle keeps you cool & hydrated all summer long! 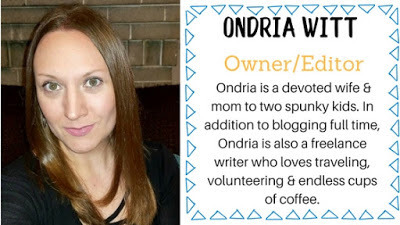 Normally, this mom constantly runs on coffee, but it's been hotter than hot this summer, and I've been making a real effort to drink a lot more water. I'm much more likely to drink water if it's easy to get to, and if it's super cold. I'm normally not a big fan of water bottles, but the more my family picks up and takes off on trips, the more I see how awesome they are to have. Most of the water bottles I've tried before just don't seem to live up to the hype, which has left me disappointed. Contigo has a gorgeous new Couture THERMALOCK Vacuum-Insulated Stainless Steel Water Bottle, and it's become the one thing I won't leave home without this summer. It's beautifully designed. If you love pretty little things, this is the water bottle for you. The stainless steel keeps whatever you put inside cool for up to 24 hours, or keeps hot beverages hot for up to 10 hours. Amazing! Water break on the beach- my water is crisp and cold, thanks to my Contigo Couture water bottle! I've been so glad to have my new Contigo water bottle with me at the beach this week. 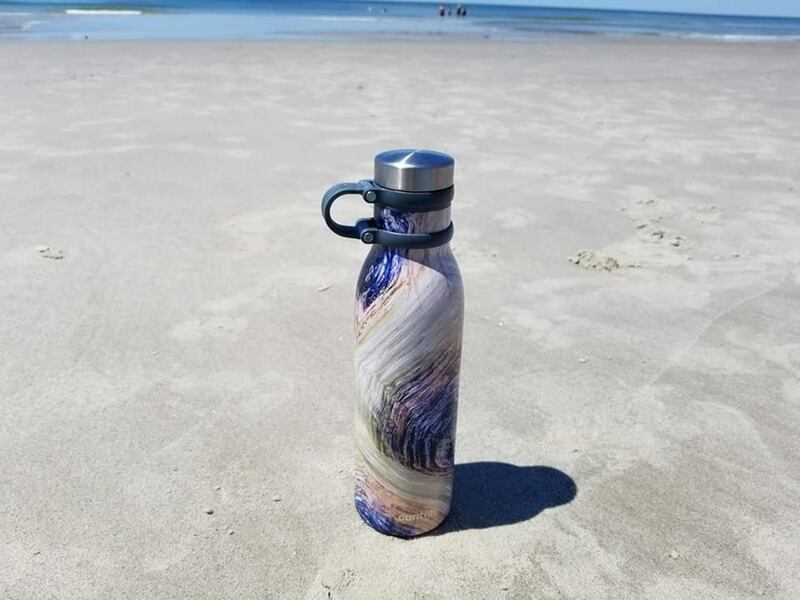 With 90-degree temperatures and lots of running, splashing, and playing on the beach with two busy little ones, I have needed every drop of the 20 ounces of water that the water bottle can hold. I've been so happy with this water bottle. My water has stayed super cold, even after being out on the beach for hours! I never had to worry about leaks in the cooler bag, thanks to the vacuum seal, which kept the water bottle tightly sealed. 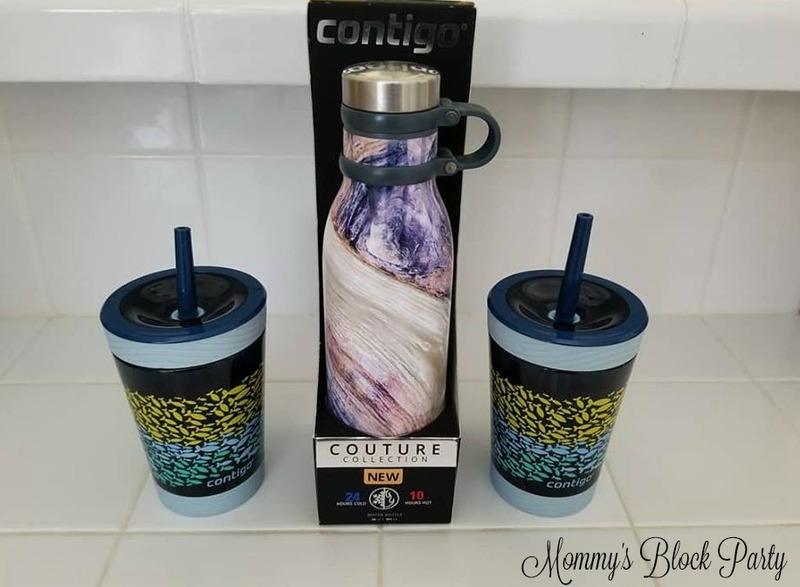 Head on over to Contigo to browse all of their awesome water bottles, tumblers, cups, and more! Stay hydrated this summer, wherever you go- with Contigo! Connect with Contigo on Facebook, Twitter & IG. 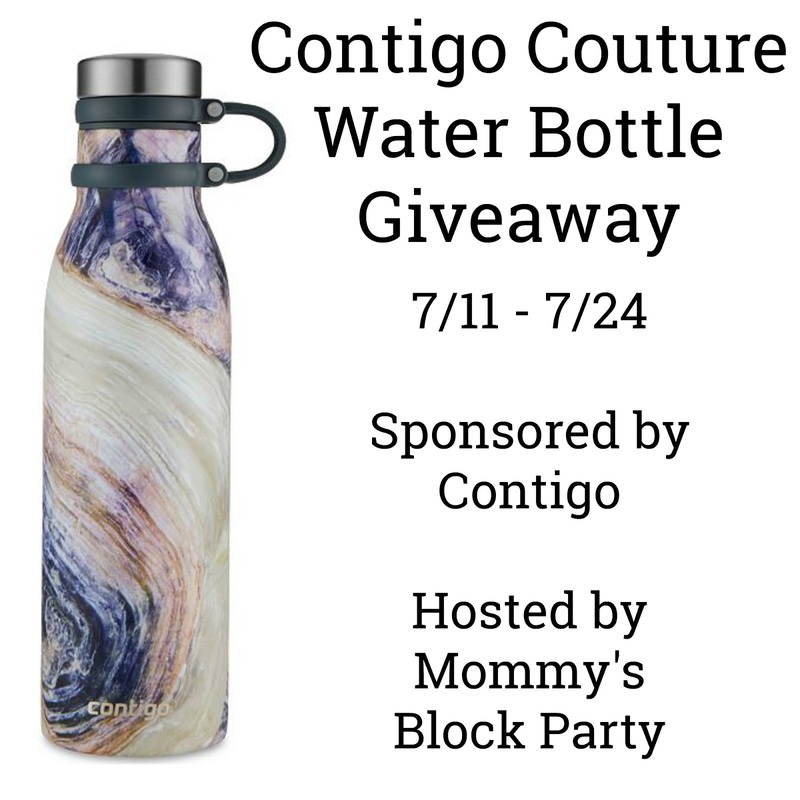 One lucky MBP reader will win a gorgeous Contigo Couture Water Bottle. Just use the handy RC entry form below to enter to win! Special thanks to Contigo for allowing me to share about their awesome products. Look for them in our 2018 Summer Fun Guide! I would take the Contigo Water Bottle to the lake and also out hiking to stay hydrated! I would take it to the skate park! Thanks so much for the chance! I would take it to the lake, beach, pool, camping and hiking and even use it outdoors for family BBQ. one thing I also like for my grandsons are the Snack Hero Drink and Snack Kids Tumblers. I would take it to the lake. I would take them to the park. I'd take it to the beach, the park and the Great Wolf Lodge! I would take it to the gym and the beach! I would take it with me when we go to Cedar Point! I would take the Contigo on a cruise. I would like to take a Contigo Couture Water Bottle this summer to the beach.